Megan & Kris recently took advantage of the Fantasmic! dinner package at the River Belle Terrace at Disneyland. In this episode, they give their review both on the package, food, and the updates to the show. 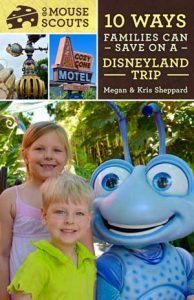 FREE EBOOK: 10 Ways Families Can Save on a Disneyland Trip! One of the very first things we hear when we talk to other people about visiting Disneyland is, “That sounds like so much fun, I wish we could go! It’s just so expensive.” After hearing this so many times, we started to look for ways that families could save on a Disneyland trip. We found that while a Disneyland trip will be expensive (but totally worth it), you might be surprised to find that with a little forethought and planning, it can be within your reach! In this short ebook, we’ve grouped our tips into three main categories: tips on saving and collecting extra money for your trip, saving on the trip itself, and ways to save at the parks on food and souvenirs. We even added five bonus tips on some free and inexpensive things you can do at Disneyland! Sign up for our email list (below) and we'll email it right out to you! We'll also let you know when our Guide to Visiting Disneyland with Young Kids is released and keep you up to date on news, contests, and our latest podcast episodes. By the way, you also get our two previous freebies: Disneyland Resort Scavenger Hunts and our Unofficial Day at Disney Resource Pack!